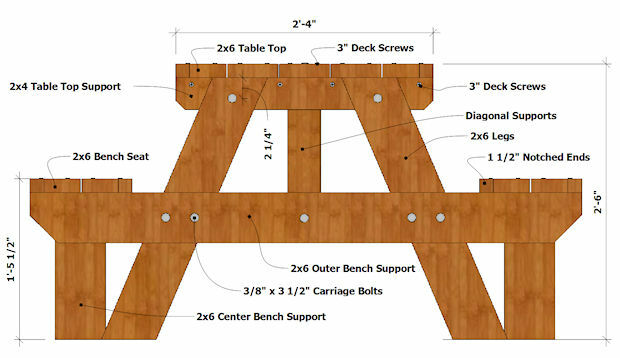 These 8 foot picnic table plans are ideal for large families or groups. It can seat up to eight people (10, if you count a person sitting at each end). Note: Before cutting any wood or building any part of this picnic table, read through to the end of these instructions so that you can verify the materials list. Also note that these picnic table plans show the table being 7' 10" long (rather than 8 feet). The reason for this is so that you can purchase 8 foot 2x6s (for the top and benches), and have room to cut off damaged or cracked ends (if necessary). If the material you buy doesn't have damaged ends, you can use the whole 8' length. The decision is yours. Note: You can use any species of lumber that you want to build this picnic table. I use Western Red Cedar. Cut five 2x6s 7'10" long from five of the 8 foot 2x6s. Cut three 2x4s 28" long out of the 12' 2x4. Cut a bevel on each end of the three 2x4s (as shown in the drawings). On a flat surface, lay out the five 2x6s side by side, with the best side facing down. Add about an 1/8" spacing between each 2x6. Position two pre-beveled 2x4s on each end of the table top (as shown in the diagram) 9" from each end, and the third one in the center. Attach the three 2x4s to the table top boards using two 2.5" galvanized deck screws per plank. Note: The 2x4 braces do not have to be flush with the edges of the table, as shown in the diagrams. Center them so that the 2x6 planks will hang over the 2x4s equally on both sides. Ensure that all of the 2x6s line up and are squared at the ends before putting in all of the screws. See diagrams below. Mark an angle (with a speed square) 23 degrees on one end of the 12' 2x6 and cut it (this will leave a 67 degree angle on the leg). Measure 31" from the long point of the previous angle cut and mark another 23 degree angle (parallel to the first angle) and cut it. (see diagram below) Using the first leg as a template, mark and cut the remaining three legs from the same 12' 2x6. From what is left from the 12' 2x4, cut two pieces 28" (2'-4") long (these are the table top supports). Notch the ends as shown in the drawings. 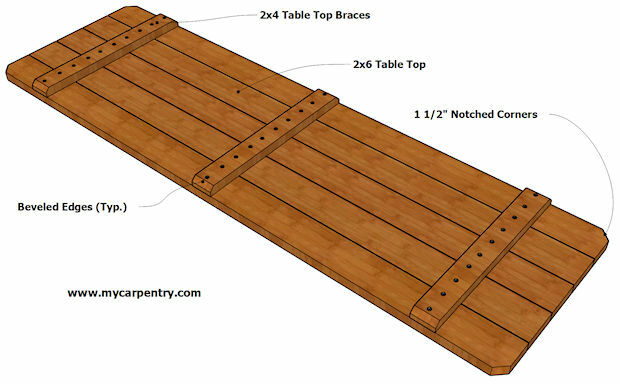 Place the legs on the 2x4 (as shown in the diagram) and secure them on the edges with two 2.5" galvanized deck screws. Note: Once assembled, all of the parts of the leg assembly will be permanently fastened together with carriage bolts. Make note of where the carriage bolts are to be placed so that your deck screws won't be in the way. From the 10' 2x6, cut two pieces 60" (5'-0") long. These will be used for the bench supports. Measure up 16" (1'-4") from the bottom end of each leg and make a mark. This will be the height of the bench support. Line up the top of the 60" bench support with the marks made from the previous step. Center it between the legs so that an equal amount of 2x6 is extending past each leg. (see the diagram below). Temporarily secure the bench support to the legs with two 2.5" galvanized deck screws. Drill 3/8" holes through both boards where each piece connects (as shown in the drawings), and secure the pieces together with four 3/8" x 3.5" galvanized carriage bolts, washers, and nuts. Note that the holes that secure the legs to the upper support should be drilled 2 1/4" from the top of the upper support (see Diagram F). This is so that when you attach the leg assembly to the table top braces, the carriage bolts won't be in the way. Repeat the steps above to assemble the remaining leg assembly. Make another 17" mark on the underside of the table from the inside plane of the bench support (point B) to the center board on the underside of the table (point A). The long points of the 24" brace, when attached, should line up with these two marks. If they don't, tilt the leg assembly until the marks line up. This is required so that the legs and table top will be a perfect 90 degrees. Temporarily secure the braces with 2.5" galvanized deck screws and finally, with carriage bolts. With the diagonal braces in place and secured, flip the table upright. Cut four 7'-10" bench seat boards from the two 10' 2x6s and the two 8' 2x6s. On each side of the table, center two of the bench seat boards between the two 2x6 bench supports. The bench seat boards should overhang the same amount on each end and on both sides of the picnic table, and spaced approximately 1/8" apart. Once you are satisfied with the placement of the 2x6 bench seat boards, secure them to the bench supports using two 3" deck screws on each end. From the two remaining pieces of 2x6, cut two pieces 16" (1'-4") long. These will be used for the center bench supports. Locate the center of the bench seat and place one of the 16" bench supports upright under the bench. Attach the bench seat support to the bench seat boards using two 3" deck screws (one per bench seat board - see diagrams). From the remaining 2x4 material, cut four seat braces about an inch less than the width of the double 2x6 bench seat (roughly 10"). Sandwich the 2x6 center bench supports with these 10" seat braces (as shown in the drawings) and secure them to the bench seat from the bottom with four 2.5" deck screws per brace. Add the remaining carriage bolts and missing deck screws. 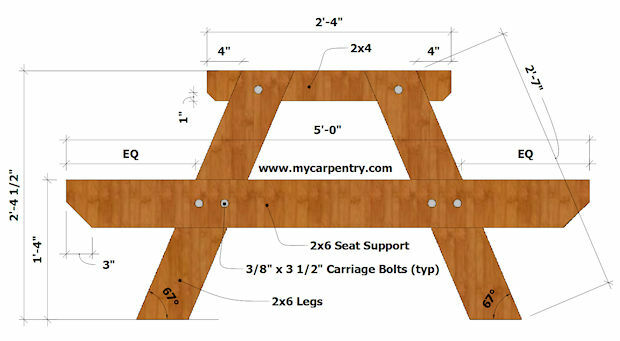 I hope you find these 8 foot picnic table plans helpful when you decide to build a picnic table. 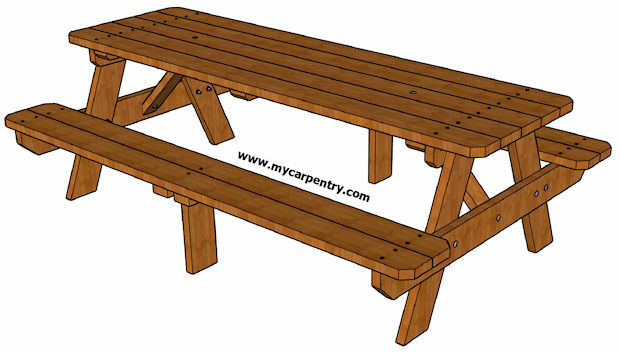 Check out the other picnic table designs on our free picnic table plans page. If you are wondering what species of wood to use for your picnic table, this link will take you to a site that shares some good information.